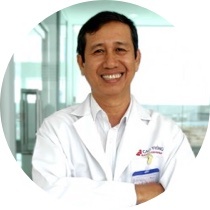 Doctor Ngo Van Hong join part - time work at Cao Thang Eye Hospital since 2009, he has been Senior Consultant and Lasik surgeon. And, he still a ophthamologist of Cho Ray Hospital. 2009 - now: Part-time work at Cao Thang Eye Hospital. - September, 2006 : Certification of Refractive Surgery Training Course in Bangkok, Thailand, from Nidek Co., Ltd..
- 1983 – 1989	: Hue University of Medicine.